I’ve always loved the holidays. I always loved the anticipation of waiting for my family members to fly in from their exotic, far-away homes so that we could all spend time together. Now, while my family is a little untraditional, given that my parents are divorced, there are a few family traditions that have only made the love of my holidays grow, especially now that I’m not living at home. So, since it’s the spirit of the holidays, I wanted to list a few family traditions with you that always help me enjoy the short time we have together more than any time of year. Baking/Cooking: One of my favorite things to do when I go home for the holidays is to indulge in my family’s home-cooking. I come from a large Hispanic family and am always excited to indulge in homemade meals of tamales, chile rillenos, and carne asada. My aunts, mother, grandmother and I will spend hours in the kitchen, cooking, baking, and sampling the meals we put together and it always makes me feel so at home when I get to be in the kitchen with them. 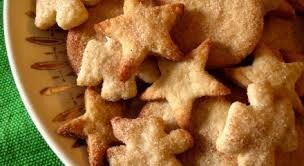 Especially when my grandmother is making my favorite bizcochos, Mexican sugar cookies that will always remind me of her. Though itcan be tedious and stressful to cook a big meal for a multitude of people, these are the kind of memories that I know I will have for the rest of my life. So, this holiday, spend some time with your family in the kitchen; who knows, you may pick up a few new cooking tricks. Traditional Mexican sugar cookies. Photo courtesy of google images. Quality Time: Whenever I go home for the holidays, I always want to spend “quality time” with my family. However, more often than not, my brother and I will get wrapped up in our computers, cell phones, video games – it’s the age of technology, after all. So, a tradition was formed many years ago that, when my family gets together, we all trade-in our tech devices for a board game. I know, it sounds a little lame, but it’s always so much fun. We prefer the game Taboo which involves splitting into teams and choosing a card from the pile that has a word on it. The word on the card has to be described to your respective team without saying keywords also listed on the card. For example, if the word is “Pineapple” the words listed that cannot be used to describe Pineapple could be “yellow, fruit, spiky,” etc. I highly recommend it for any family, especially because it starts some friendly competition. This holiday, really spend some time with your family by setting aside technology, even if it’s just for a movie. Ice Skating: By far one of the most fun activities I’ve participated in with my family is ice skating. Now, I’m from El Paso where the closest thing to snow and ice is what’s sitting in my freezer. However, the local hockey rink in my town opens up to the public when the holidays roll around and my ten cousins, my brother, a few of my aunts and I love heading over to make the most of the ice rink. It’s always a fun time that really symbolizes the holidays for me, especially when we all go home and drink hot chocolate afterwards. Don’t have a hockey rink in your town? That’s OK! Try bowling, laser tag, or some other activity that gets you and your family out of the house. Just because you’re home for the holidays doesn’t mean you have to stay at home. Enjoy a little outing with your family to really get into the holiday spirit. Light Shows: Every city I’ve ever been to has one street that is recognized for its light decorations. So, every year, my cousins and I will pile into the car and go in search of the best display of holiday lights we can find. Sometimes, we turn up empty and sometimes we stumble on some of the greatest display of lights, with tons of color and creativity. Whether it’s the firer or the latter, it’s fun piling into a little car with the people you love and going on a little adventure. Do Nothing: One of my favorite part of the holidays is the ability to do nothing. No work, no papers, no books I have to read; it’s the complete freedom of doing nothing and not feeling like I’m wasting time. This is the whole theme on the day of Thanksgiving where, after having Thanksgiving with my mom’s side of the family, I go to my dad’s and spend the day laying around with my cousins, eating and doing absolutely nothing. It’s the perfect day where we get to catch up, play spur-of-the-moment games, watch movies, and have no real plans. I know that the holidays can be filled with a “schedule” of things to do, places to go, people to see, especially if you live out of town and are coming home. Sometimes, when I visit, I feel like there’s a to-do list to complete before I’ve even landed on the ground. However, I always take one day where I have no plans and can just enjoy doing nothing. It’s always a refreshing treat and really helps me to decompress before the madness starts all over again the next day. So, this holiday season, take a day for yourself to do absolutely nothing but enjoy the solemnity of having no real task list; sleep in, see a movie you’ve always wanted to see, see old friends, go out for a drink at your favorite bar – the list is endless. Trust me, you’ll be so glad you took a day just to enjoy life. In the end, the holidays, for me, are about spending time with my family, which has become even more important since moving away. I don’t get to see my family as much as I used to and the distance has made me realize just how much I miss them and appreciate them, for all their imperfections and talents. For me, that’s what the holidays are all about, spending time with the people who love you most in the world and really letting yourself wind-down so that you can prepare for the new year to come. This holiday season, start some new traditions of your own with your family, and for yourself. Try doing some fun DIYs, cooking, playing a board game, or even just sit down and watch a Christmas movie together. The memory of a holiday spent this way will stick with you forever, no matter how close or far you are from them.